Hooray!!! I have the Basin Cemetery records published. I have name extractions for Atwood Funeral Home in Basin. I don't know when they will be published. The entire index of the Worland Grit and Northern Wyoming Daily News will be available soon, thanks to Allena Austin's work. I don't know when I will get it published. 1895 Wyoming Map This link takes a while to download, so be prepared. 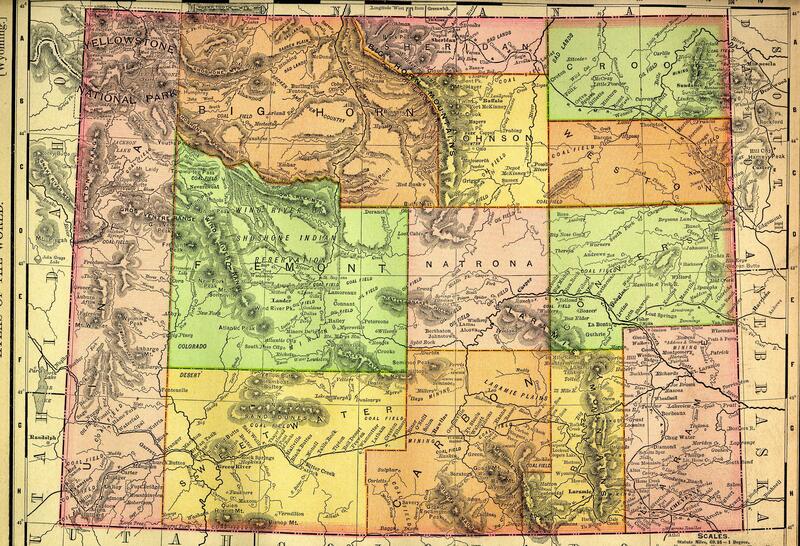 It is, however, a valuable historical map of early Wyoming. "Are you having problems reading the lettering on older tombstones, or stones that are white and the lettering is also white, or dark stones with dark lettering? Here is an answer. Take a can of foamy shaving cream and shoot it onto the stone. Scrub it thoroughly into the lettering. Take a short handled squeegy like that used for cleaning windows and wipe across the stone to remove the excess shaving cream and Wa Laaaa! You will read even the most difficult of stones. Your photos of the stone will be outstanding. And, when it rains or the cemetery is watered, all traces of your work are gone with no damage to stone or grass." Worland Cemetery Database All Tombstones. The Tombstone Inscriptions Are On Their Way. The recording of stones is done, but needs to be typed.